The former cycling champion will debut in a mountain bike event and the Ultratrail world champion, has already competed in several. 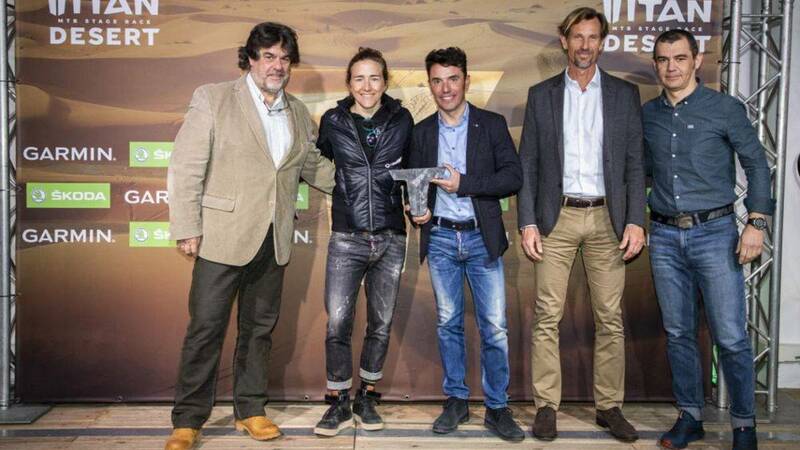 The former professional runner Joaquim 'Purito' Rodríguez and the Ultratrail world champion, Núria Picas will be two of the protagonists of the 14th edition of the Garmin Titan Desert, one of the most prestigious mountain bike (MTB) events will compete in Marruecos from April 28 to May 3 next. The layout of the race, which will consist of six stages, has been unveiled today in Barcelona and will have a distance of 640 km and a vertical drop of 5,911 meters.
" It's a new challenge for me, I've won a lot on the road, but I'm starting from scratch on this big wheel, it's an adventure, I want to enjoy it . Everyone talks to me, everyone knows this test and I want to live it. the 'mountain bike' is different, it costs a lot to catch the point and what is clear is that you have to work the bottom, "said 'Purito' Rodríguez. Although he talks about having fun utar of adventure, says that, "It will be my first race in MTB and it will be difficult, but when you put a race number to compete you always give it everything" . 'Purito ', 39 years old and with 45 victories as professional, will have as a partner Oliver Aviles, gold medal in relays in the World Championship of mountain biking of 2005. The difference for the former runner is that, "I come from a world, the road cycling, in which you just had to pedal because the route was perfectly traced. In the Titan you have to orientate yourself and also sleep in jaimas, something totally unknown to me. " For the manresana Núria Picas, 42 years old and Ultratrail world champion, the mountain bike is not unknown because it is used by her physical preparation "Some athletes of my specialty train with cross-country skiing, but I do it with the MTB", explains. The organizers presented a new sponsorship with the automotive brand Skoda and explained that 80 days to the beginning of the appointment already have 580 registered. "The goal is to reach the 700 and at this rate we will soon have to hang the poster of everything sold, which is what any organizer wants", indicated Felix Dot, general director of the Titan Desert. The technical director of the carrera, Manu Tejada, was in charge of revealing the route that for him will consist of two parts differentiated because, "the first part is very desert and in the second the stages are more mountainous" . I highlight the third stage, between Ouzina and Merzouga of 118 kilometers and 1,555 meters of altitude, a marathon stage without navigation aids, as well as the fifth between M'ssici and El Jorf (125 kilometers with 1,535 meters of vertical drop) that crowns in an ascent to 1,300 meters of altitude. The descent is made by secondary tracks until facing the only kilometers of asphalt of the entire route.